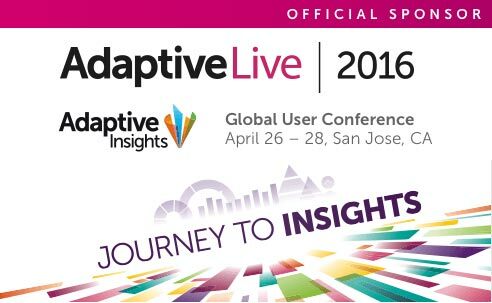 At the recent 2016 Adaptive Live user conference, I had the opportunity to present a session along with a panel of our customers about the benefits of making Adaptive Insights the central hub of decision-making. Many organizations fail to fully utilize the breadth of capability within Adaptive for making solid business decisions by limiting the scope of data from which they work. Part of the reason for this is the mindset among some finance professionals that they should be concerned only with financial data. Another reason is that importing data from external systems can be time-intensive and problematic. What I conveyed, and demonstrated through my company’s own use of Adaptive, is that unifying data within Adaptive is not as challenging as one might think. Step 1 is critical because, as the saying goes, “garbage in – garbage out”. It’s important to take stock of the data being generated in external systems to make sure that it is credible and in the appropriate format for importing into Adaptive. Step 2 begins with identifying a discrete number of drivers (I recommend 10 or so) that really move the needle within your organization. These are the key elements for measuring financial and operational performance. By qualifying a smaller set of drivers, it is much easier to focus on the important variables where decisions have the greatest impact. One thing to note, you should also incorporate non-financial drivers within Adaptive. The best way to determine these is through feedback from your colleagues in different areas of the business. After all, the benefits of Adaptive can and should be distributed throughout your organization. Step 3 is an interim step that helps you understand how you should structure your data for import. It also allows you to troubleshoot any technical issues or questions that may arise. You can then test how that data would display in Adaptive and make any changes as required. Step 5 is about quantifying the benefits that you have received through automated integration. While you should realize efficiencies in short order, it’s always a good idea to be able to report to the executive team the benefits you’ve enjoyed. Furthermore, by reducing the amount of time spent on these types of manual processes, your FP&A team will have much more time for value-added analysis, which is covered in the next step. Step 6 is a focus on thorough and thoughtful analysis based on quality, comprehensive data which naturally improves the quality of decisions. The data and analyses that your team develops should be distributed to other stakeholders outside of finance. What better way than to provide self-service dashboards and reports? This is a key functionality offered by Adaptive Insights’ Discovery product. Our own experience making Adaptive Insights a central hub for business decision-making has paid off with tangible returns. Best of all, it can be done with relatively little effort and cost. If you are interested in transforming Adaptive Insights into your own central hub for decision-making, contact us today to schedule a discovery call and demo of DataBlend.